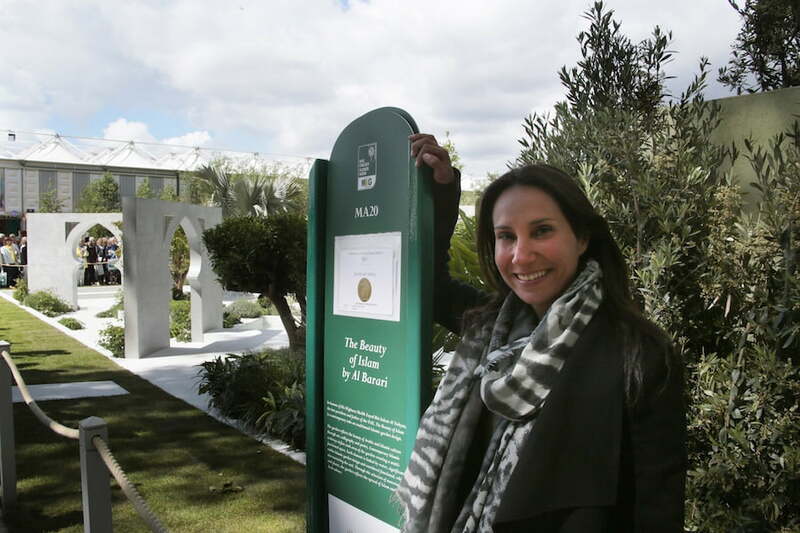 ‘The Beauty of Islam‘ garden by Al Barari at the 2015 Chelsea Flower Show was designed by Dubai-based landscape designer (and GardenDrum contributor) Kamelia bin Zaal. It was a first Chelsea garden for Kamelia, and won a Silver Gilt medal. The Beauty of Islam is a sanctuary garden, featuring peaceful spaces and plants that are connected with the Arab world, either thriving in its arid climate, or arriving through the centuries via the Spice Route and Arab traders. Plants included aromatic rosemary, grey Bismarkia palms and papyrus, and edibles such as citrus, olives, pomegranates, figs, cardamom and coffee. Designed using strong diagonals to break up the space paved with Turkish marble, a long water rill with bubbling fountains set in three star-shaped ponds angles across the garden. Four Islamic arches with a pearl-grey finish encourage a wander among the plants that tell the story of the spread of Arab trade and Islamic religion and culture. The garden is decorated with calligraphy, including verses from the Holy Qu’ran, a beautiful waterwall and a ‘floating’ stainless steel sculpture. Very different, tranquil and calming, a great composition ! Isn’t Rosemary an Australian plant?? The plant we call by the common name ‘coast rosemary’ in Australia, is actually a Westringia. True rosemary – that’s the herb we use in cooking and potpourri is Rosmarinus officinalis, and native to the eastern Mediterranean. Botanical names may be difficult but common names can be very confusing!